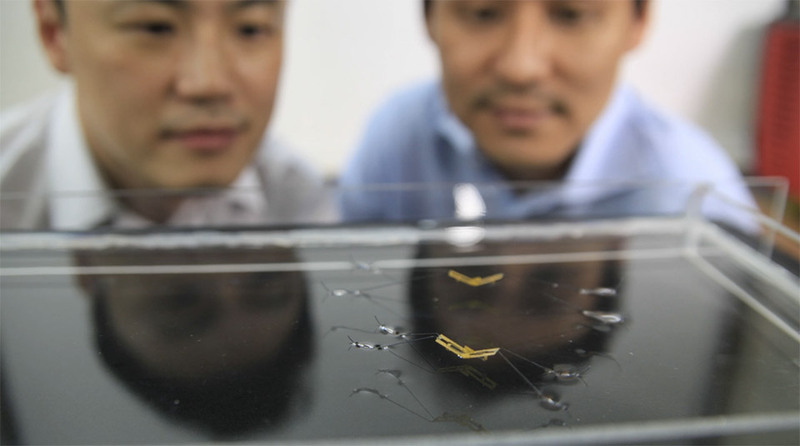 Scientists at the Wyss Institute for Biologically Inspired Engineering at Harvard together with the Seoul National University and the Harvard School of Engineering and Applied Sciences named John Paulson created a tiny robot water strider capable as his protégé live, jump on the water surface. For the most accurate copy of the insect robot devoted much time to record the behavior of water striders live on camera and studied their movements. "We need to correctly and accurately calculate the speed, pressure and time exerted by the robot on the water legs to ensure the possibility of the jump. Live skaters do it quite naturally ", - says Cho Kyu Jin, one of the leaders of the project. The researchers discovered that water striders are able to do all these things perfectly because of their small rounded paws. Once scientists have found the morphology and movement to copy, robotics built robot insect that uses ultra-bailout mechanism. It is capable of producing power at 16 times the weight of the robot, without disturbing the surface of the water and allows the robot to make the jump. It should be noted that another team of scientists created a robot-like insect about a year ago. However, the robot was much larger than its actual version. The new robot is turned size much closer to the real water strider, as you can see, looking at the video below. Small robots like this may one day be used in search operations, and other tasks that require a very delicate approach. And since this particular instance was created from composite materials, then establish mass production of such robots will not be difficult.